Suzuki Hayabusa is one of the most recognised sports bikes in India. The Hayabusa is a sports tourer that is designed for long-distance cruising. It is also one of the most comfortable sports bike available in the market. 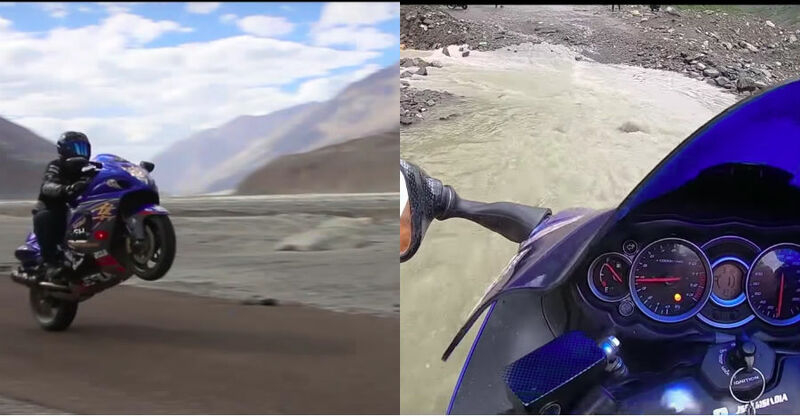 Jasminder Singh, a YouTube-vlogger, took his Suzuki Hayabusa GSX-R1300 to the Ladakh region. Here is the video that is absolutely captivating. While Hayabusa is designed for long-distance cruising, it sure is not made for rough terrains. The Hayabusa is extremely heavy and very powerful and any loss of control on high mountain passes of the region can be dangerous. Controlling such a powerful machine is challenging, especially when you have to traverse extremely rough terrains, water crossings and black ice. The video shows Hayabusa’s journey from the plains to the extreme regions of Ladakh. The video shows how the bike handled numerous water crossings successfully. A slip in such water crossings can be dangerous. However, no such events happened during the trip. The video also shows that the Hayabusa reached many different places in the Ladakh region like the Nubra Valley, Pangong Tso lake and the Khardung La pass, which was once the highest motorable road in the world. The roads to all these places are not very smooth and in many places, there are no roads to speak of. Even climbing the Khardung La can be extremely difficult due to snow near the pass, which makes the roads slippery. The Hayabusa is powered by a 1,340-cc, inline four-cylinder engine that generates a maximum of 197 Bhp and a peak torque of 155 Nm. The bike gets a power mode selector that reduces the power according to the need and situation. Still, in the lowest power mode, it produces over 100 Bhp, which is too much power. Also, the extreme weight of around 250 kg can make the rider lose control easily during slow speeds. In the Ladakh region, there are many tight hairpin bends that require special attention with such heavy bikes. There have been a few powerful cars that have traveled through the Ladakh region before. The RedBull Formula 1 team took their vehicle to Khardung La a few years back, but they took whole support crew along, and the vehicle was mostly transported in trucks on bad stretches. This Hayabusa did not get any such help. « Meet the BADASS Maybach that makes a Rolls Royce feel cheap!